Lachcha Semai / লাচ্ছা সেমাই is must have dessert For Eid in Bangladesh (Even in Indian and Pakistan ). Though we read and see lots news about hygiene issue of commercial Lachcha Semai making. Though making Lachcha Semai at home is not hard, can be little bit tricky for 1st time but trust me not hard. So hopefully you will make homemade Lachcha Semai in this festive season for your loved one. And also need oil for deep fry. Mix water and flour and make hard dough. Melt ghee / vegetable shortening and mix with oil and cornflour. Divide the dough into three and give donut shape to press thumb in the middle of it (check photo). And soak all dough in oil mixture. Now check video to stretch each dough, fold and soak it in oil. Heat the oil and fry each dough at a time on medium heat. When you are frying Semai, give a shake of semai with spatula or fork which will spread or separate the semai thread. When semai is fried, remove it from oil and place on a paper towel. Let yummy homemade Lachcha Semai cools down before you put in airtight container or cook it in your favourite style. Folding Semai is tricking ( I will say delicate) part of making semai so you have to be careful and do it gently . If you are not confident about folding Semai, rest it 15 minutes after every 2nd Though I rested the dough for 15 minutes after 4th and 7th time of fold. 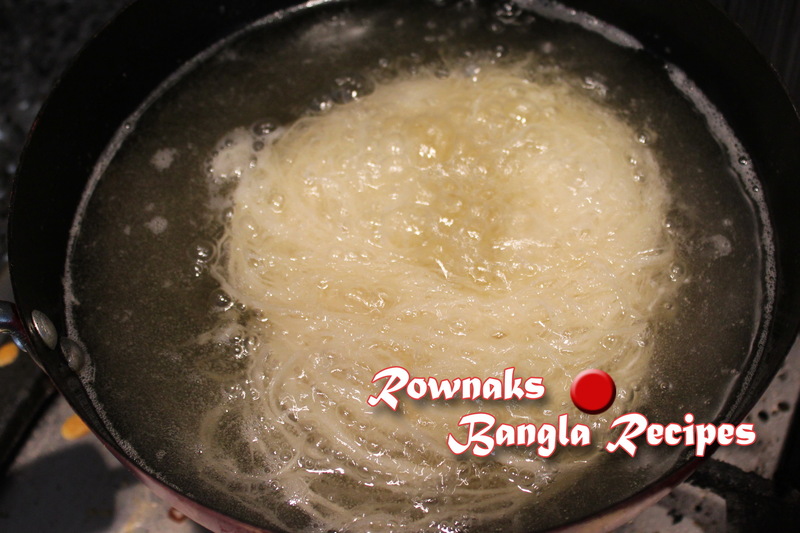 When you are frying Semai, give a shake of semai with spatula or fork which will spread or separate the semai thread.